With lightest-in-class weights, bright reflective graphics and a smooth, stable ride, Cannondale's 2019 Quick 5 Disc Hybrid Bike is a fast, fun way to get fit and get around town. Frame Material: Quick Disc Women's, SmartForm C3 Alloy, SAVE, 1-1/8" headtube. Fork: Quick disc, Alloy, 1-1/8" steerer, 55mm offset. Front Derailleur: Shimano Altus, 31.8 clamp. Rear Derailleur: Shimano Acera, 9-speed. Cassette: Sunrace M90, 11-32, 9-speed. Brakeset: Tektro M-285 hydro disc, 160/160mm. Handlebar: Cannondale C4, 6061 Alloy, 20mm rise,10 deg sweep, 600mm. Stem: Cannondale, 6061 alloy, 31.8, 12 deg. 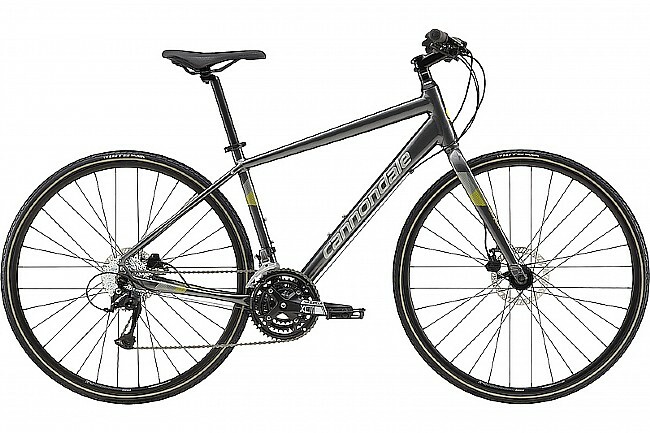 Saddle: Cannondale Fitness Women's Ergo. Rims: Cannondale C4 Disc, double wall, 32-hole.